by Robin Siegerman Author · Steve Thomas Author of introduction, etc. are only the opening skirmishes when planning a kitchen renovation battle plan. 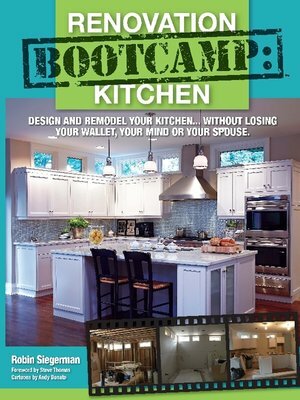 Renovation Bootcamp: Kitchen is the ultimate step-by-step, behind-the-scenes manual to remodel a kitchen. "Tales from the Trenches" from the author's own jobsites. the novice and seasoned renovator alike plot a logical course of action before jumping into the fray. ask the right questions when shopping for cabinetry, appliances and materials and so much more. they'll save time, money, sanity and win the renovation war!